UberMenu 3.4 brings a variety of new features and enhancements to your mega menus. This article will run down the biggest changes and how they’ll affect you moving forward. The biggest change in UberMenu 3.4 is the update from Font Awesome 4 to Font Awesome 5. Font Awesome 5 introduces new icons, offers SVG icons in addition to font icons, and breaks backwards compatibility with Font Awesome 4 icon classes. We’ve worked hard to make sure the transition to the new icon set is as smooth and painless as possible. Font Awesome has traditionally been drive by font icons – that is, a special font face which contains icon glyphs, which can be applied via i tags and special Font Awesome classes. Font Awesome 5 now offers SVG (scalable vector graphics) icons. UberMenu 3.4 supports both options. It will load Font Awesome as Font Icons by default for maximum compatibility. Learn more about the options. In Font Awesome 5, some of the icon classes have changed since Font Awesome 4. That means that if you’ve previously set icons, those classes may no longer be compatible with Font Awesome 5. Not to worry! UberMenu automatically converts your Font Awesome 4 classes to Font Awesome 5 when necessary. That means the update should be totally transparent, and your previous icon settings should just work. UberMenu also has a migration system that will find any Font Awesome 4 classes and convert them permanently to Font Awesome 5. We’ve added a bunch of new icons from Font Awesome 5 to the core plugin as well! The Icons Extension has also been updated to use Font Awesome 5 and incorporate all the latest icons. If you are using the Icons Extension, you’ll want to update the Extension at the same time. As a new usability feature, when submenus are opened on mobile, a close button will appear in place of the submenu indicator. This setting is enabled by default. It can be disabled in the Control Panel if you’d prefer not to have it. 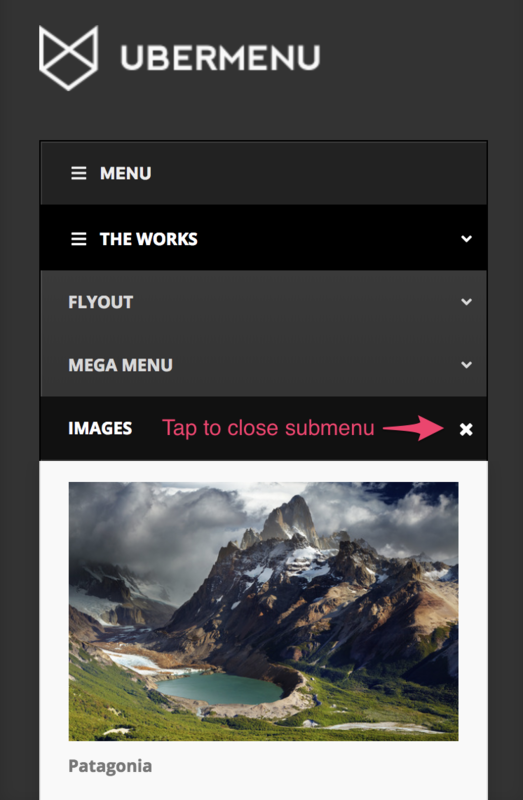 This new feature is intended to supersede the the Submenu Close Buttons that appear in the submenu itself. These will be disabled by default moving forward. Customers who are upgrading will have their previous settings retained. We recommend disabling this setting at this point as it is generally redundant when using the new Submenu Indicator Close Button. 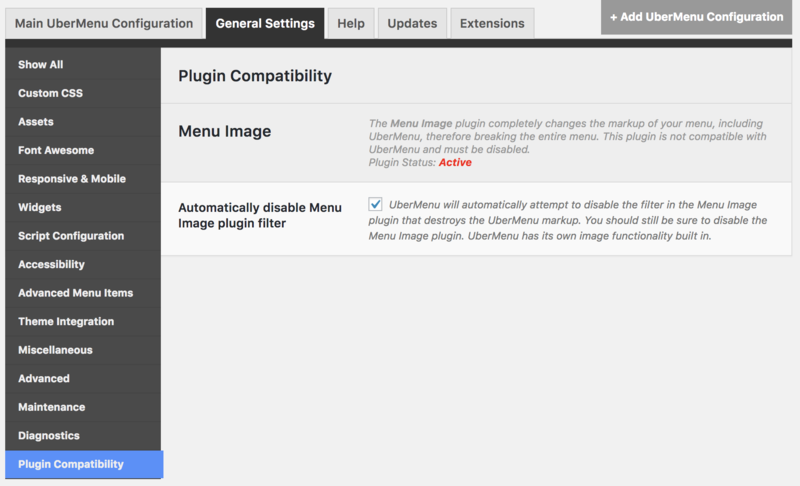 UberMenu now has the ability to detect and attempt to disable plugins that interfere with it. 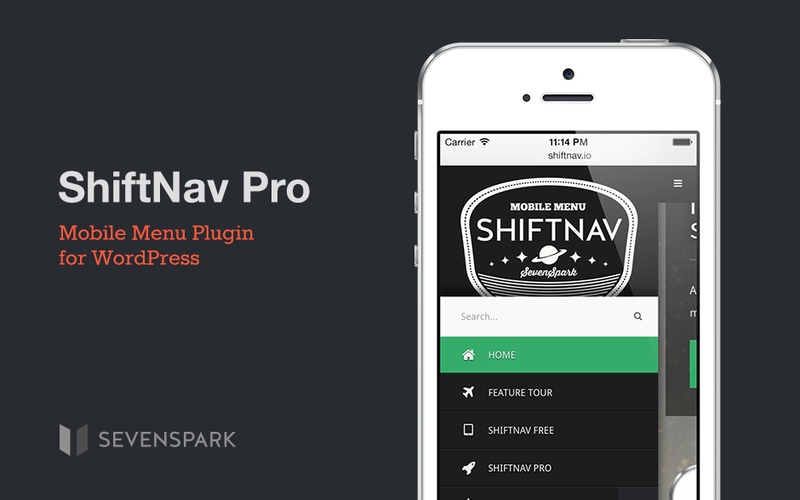 The first such plugin is the Menu Image plugin (available on the WordPress repository). This plugin changes the markup of UberMenu, and therefore the UberMenu styles no longer apply, completely breaking the menu. Since this plugin has caused major headaches for customers, UberMenu will now detect the Menu Image plugin and disable its filter to prevent it from interfering. This can be disabled in the Control Panel if necessary. Note that UberMenu has its own advanced image functionality, so the Menu Image plugin is not necessary anyway. UberMenu has the ability to set up a menu item to scroll to a particular hash on a particular page. When setting up multiple links to the same page with multiple ScrollTo destinations, these items will all be highlighted as “current” by default by WordPress when the base URL matches the current page. UberMenu now disables the current class on items with ScrollTo set on them by default. This can be disabled in the Control Panel > General Settings > Script Configuration > ScrollTo Settings > Automatically Disable Current Item Classes on ScrollTo Items if not desired. These are the major updates in UberMenu 3.4. Additionally, we’ve added minor features like the ability to set column background colors, the ability to show the current tab panel with a single setting, an icon title accessibility setting, various RTL improvements, the ability to nudge icons vertically for precision alignment, a new filter for Dynamic Terms custom content, and more! Check out UberMenu on CodeCanyon for the full changelog.